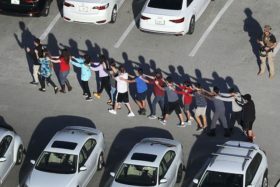 An angsty teenager trudges into Marjory Stoneman Douglas High School on Wednesday, Feb. 14, after an Uber drops him off just outside. His bag weighs him down more than usual this particular day; however, and it’s not the extra homework.Within just over an hour inside the building, he loads his AR-15 rifle and fires over 100 shots, killing 17 (and injuring 14). Nikolas Cruz, 19, the suspect, was taken into custody soon thereafter. This is real. This is Columbine, this is Sandy Hook, this is Belsan, this is a cycle. And this could just as well happen to us. It only takes one to kill a hundred. We lost 17 lives this Valentine’s Day at the hands of a boy with no restrain and at the hands of a government with no reins. One of the victims was a 17-year-old star swimmer who had just been awarded a scholarship for the fall to begin his career, his life. Another was a 14-year-old freshman in JROTC who volunteered at a natural disasters reform organization on the weekends. Who gave Cruz the right to put his life above everybody else’s? Nobody. Who gave him the idea that it was possible? We all did. We did not heed the dozens of warnings preceding this. We need to address the issue that is of such prominence today. We need gun control. Though what holds us back is the issue of infringing the Second Amendment, our right to bear arms, we need to filter the individuals deserving that right. According to NBC and CNN, many students who had come into contact with Cruz had reported obvious indicators of his reckless behavior. One of his former classmates says, “He went ahead and showed me all his layout of guns, said that how he would just shoot them around for fun.” This had been almost a year ago. Cruz had been 18. Those adjudicated as mental defectives or incompetents or those committed to any mental institution. Persons less than 18 years of age for the purchase of a shotgun or rifle. The Sun-Sentinel reports that Nikolas Cruz, prior to Wednesday’s shooting, had been charged with 17 counts of premeditated murder. He had shown signs of mental illness both verbally and physically, he was outcast socially, and he had been academically challenged thus. Nonetheless, he had access to a gun. There will always be malice in the world; we are all too different to avoid it. The root of the problem, the social or mental hardships teenagers face, because of these differences, cannot be stabilized uniformly. Thus, we must prevent the destruction these hardships can lead to, and that is gun control. Guns were made, domestically, as defense and only that. THAT should be the defining guideline as much as it should be the focal point of education preceeding the permit to own a gun. We must assure our safety by defining our standards and not allowing just anybody to have access to a murder weapon. That means a stronger defense system on the part of the NRA-IRL towards a country that should not fear the destruction of its most innocent institutions: its schools. Our children, our parents, our staff, and our communities should not fear murder when measures could be taken to prevent it. We must stand up for us. The alternative is self-destruction.